This Macaroni Cheese Pasta & Sauce is the ultimate comfort food and a hit with children every time. It’s tasty, very cheesy, simple to cook and versatile. Serve as a Mac n Cheese snack or use it as the perfect accompaniment to a grilled chicken dish or juicy steak with some roast veggies on the side. 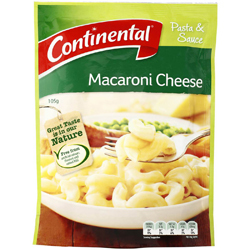 Pasta 84% (Wheat Flour), Maltodextrin, Onion, Cheese (2.2%, from Milk), Whey, Skim Milk, Corn Starch, Salt, Natural Flavours (contains Wheat, Milk and Soy), Mineral Salts (E451, E452, E508), Yeast Extract, Sunflower Oil, Natural Colours (Carotene, Carmine).